Review the PDF “Your Property In A Starring Role” This document lays our the idea of a location and the value of the resource to production. You may also call the Film Liaison Office at (805) 409-9947. If you get voice mail, please leave a name and number to that the Liaison can get back to you. 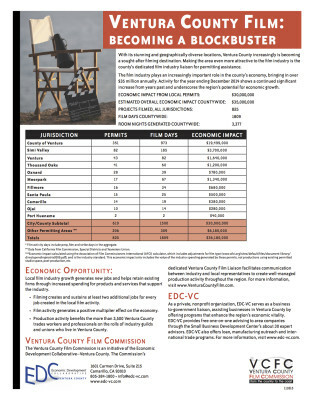 If you are interested in the economic impact of filming to Ventura County click here for 2014 impacts and here for 2015 impacts. Submitting your listing is simple and we’ve made entering your information easy and streamlined. Just fill out and submit the required information including any photos of your listing. As soon as the site administrator has reviewed the listing, it will either be published or, if there are questions, the liaison't office will reach out to clarify. 1. How long does it take to get a permit? Depends on the shoot and the location. The longer time that the permitting jurisdiction can have the better. 2. Who do I get a permit from? In Ventura County there are many different permitting agencies. First determine the location address for the shot. After that, the liaison's office or the website can direct you to the proper permitting agency or agencies. 1. Click on "My Account" located near top-right corner of screen. 2.Fill in "Username" and "Password"
1. Click on "Submit Listing" button located on near top of screen. 2. Fill in form parameters. Make sure to check "Send me a copy of my responses" near bottom of page. 3. Click "Submit Listing" button. 1.From home screen find enter search parameters in "Keywords" drop-down menu. 2.Select desired city from "All Regions" box. 3.Choose specific category from "Any Category" box. 4. Click "Search Listings" button. 1. From home screen, click on "My Account" button located on upper-right. 2. Find desired profile to edit from list. Under title of Listing, locate and click "edit" button. (button looks like a pencil). 4. Click "Save changes" button. 1. From home screen, hover over "Browse Locations" button located near top of screen. You may also select specific regions from home screen by scrolling down to "Explore Ventura County" section. 1. From home screen, click on the "Search Permits" button located near top of screen. 2. Click on desired permit city. 3. When drop-down menu appears choose, "Click for Website" button. What does listing my location or service mean? 1. We are interested in having filming or supporting filming at list location of with this service. 2. We understand that professional film companies will insure us for the use of our location. 3. We understand that the use of our location is a service to industry and can expect to negotiate compensation for that use. 4. We have done some thinking about what we are willing to allow with our location and are clear that those plans are represented in the contract that we negotiate for our location of service use. 5. If there are things that need to be discussed, as with any professional relationship, those things need to be reflected in our written agreement. 6. The providing of the location or service, in Ventura County, unless it is a permitted business within a proper zone, is a temporary use and requires specific permitting. This permitting is the responsibility of the film company. The location or service is named, insured, and protected through this permitting process. What is the impact of filming to the regional economy of Ventura County?